Monthly favourites time seems to have popped up really quickly again. I know I say that pretty much each month but November really has flown by. Quite possibly because it has been a busy month for me. December is even crazier. I have filled my blog planner for the month so there is at least one thing that should stay on track next month. As I am still working my way through my goals that I set at the start of the year, December is going to be quite stamping focused, rather than nail polish. At this point in time I only have three collections of polishes sitting in my polish racks. Anyway, I'm getting ahead of myself here. Let's talk about the things that I have loved this month. It's been quite the month for nail art for me. 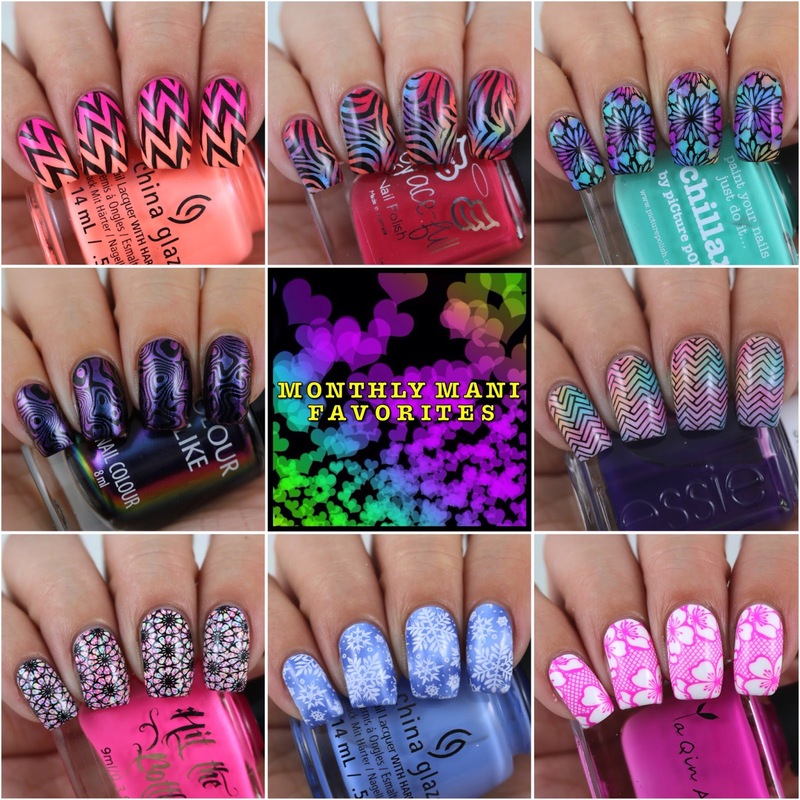 There have definitely been quite a few manis that I have loved. 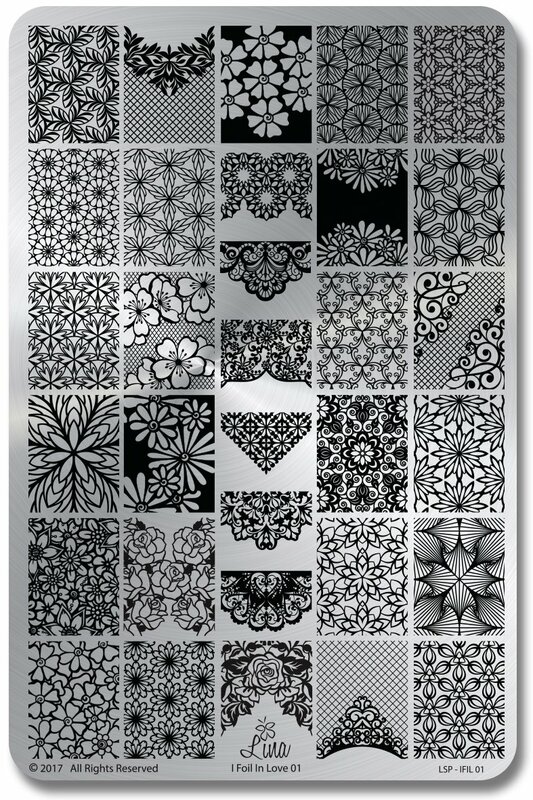 As I mentioned earlier, I have a bunch of new stamping plates to get through. I did manage to swatch my way through some new ones over the last month and have fallen in love with a few. Who doesn't love marble nails? 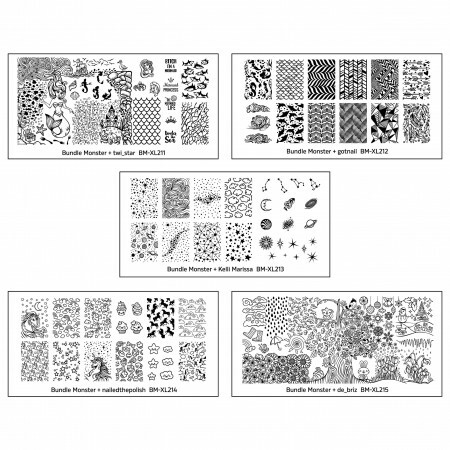 And what better way to get them than with the Marble Stamping Plate from Dixie Plates. This is such a great plate. I am a huge fan of all the images. This is definitely a "me" plate. If I had to only pick one stamping plate that I loved this month, then this would be it. This plate is perfection if you ask me. 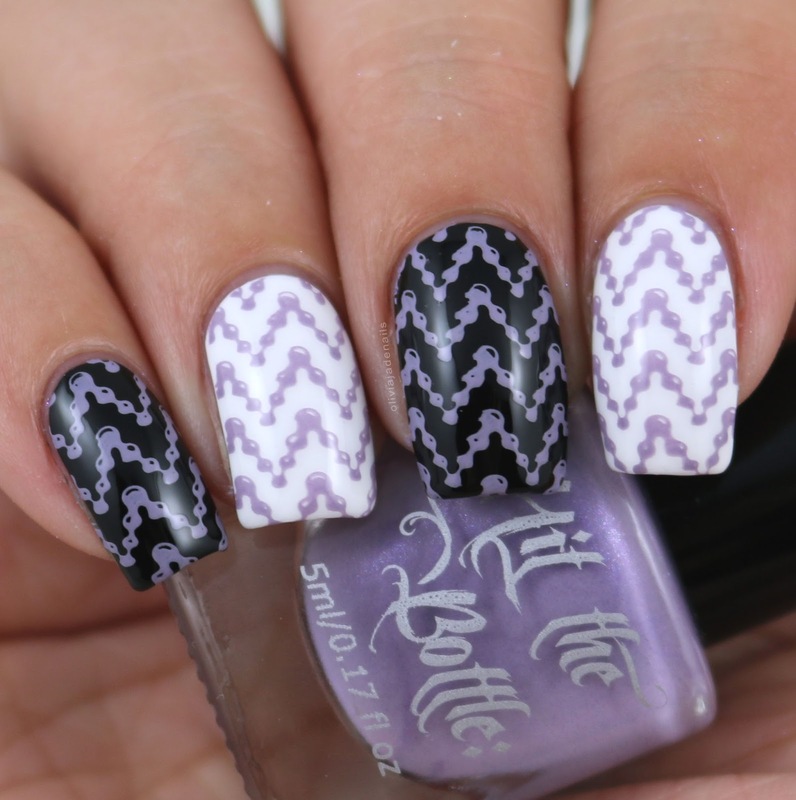 I'm obsessed with Hit The Bottles stamping polishes. They have such a HUGE range and they work beautifully. Again this month, the bulk of my polish favourites come from indie brands and two brands in particular - Emily de Molly and Grace-full Nail Polish. I have had to be really tough on myself when it comes to picking my favourites. Fairy Wings is easily my favourite from the Pixie Garden Collection. It's such a stunning colour and a great formula. Ok so this one was really tough. 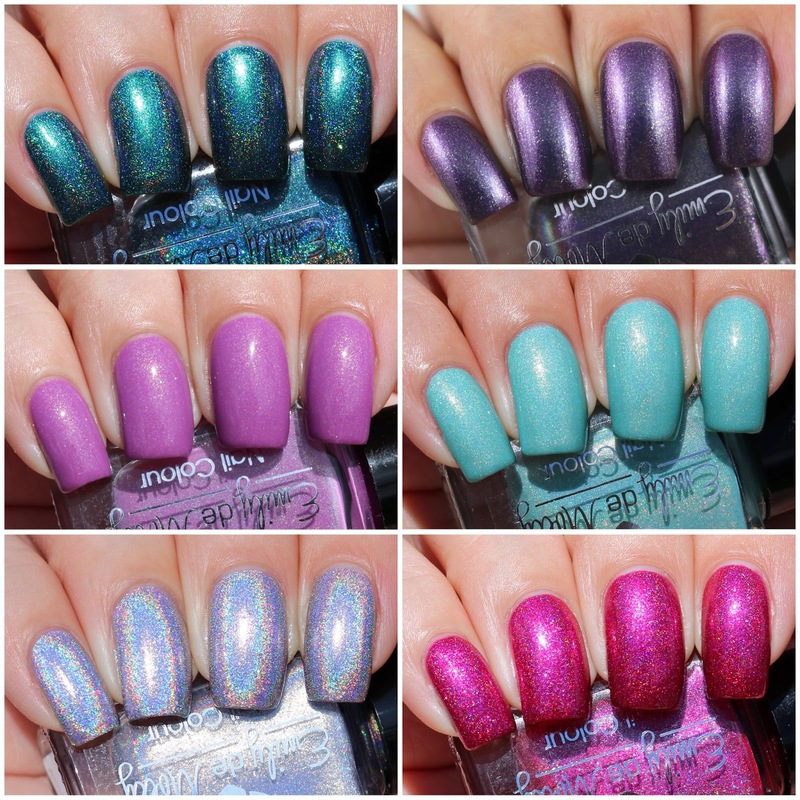 Hayley's November release was full of gorgeous holo polishes with amazing formulas. But I was tough and narrowed my favourites down to four - A Veiled Promise, Dark Enlightenment, Deafening Silence and Look Up, Look Sharp. I recently did a small swatch spam and fell in love with quite a few of the polishes - Bring The Light, LE54, LE56 and Perception Is Key. There were three stand outs from Grace-full's Vintage Christmas Collection for me. Belnickle, Chet and Rosy Glow. Seriously, all gorgeous polishes. Moving onto the mainstream brands. There were a few that I fell in love with this month. Again, I had to be tough on myself and really cut these back. There were three standouts in this collection for me - New Year New Boo, Santa's Side Chick (which came as a huge surprise for me) and Teal The Fever. This is a great Fall Collection and two of them stole my heart - Saved By The Belle and As If. This polish is hands down my favourite from the Love OPI, XOXO Collection. It's such a stunning polish. And that wraps up November. Now bring on December! Let me know what polishes you have been loving you this month. 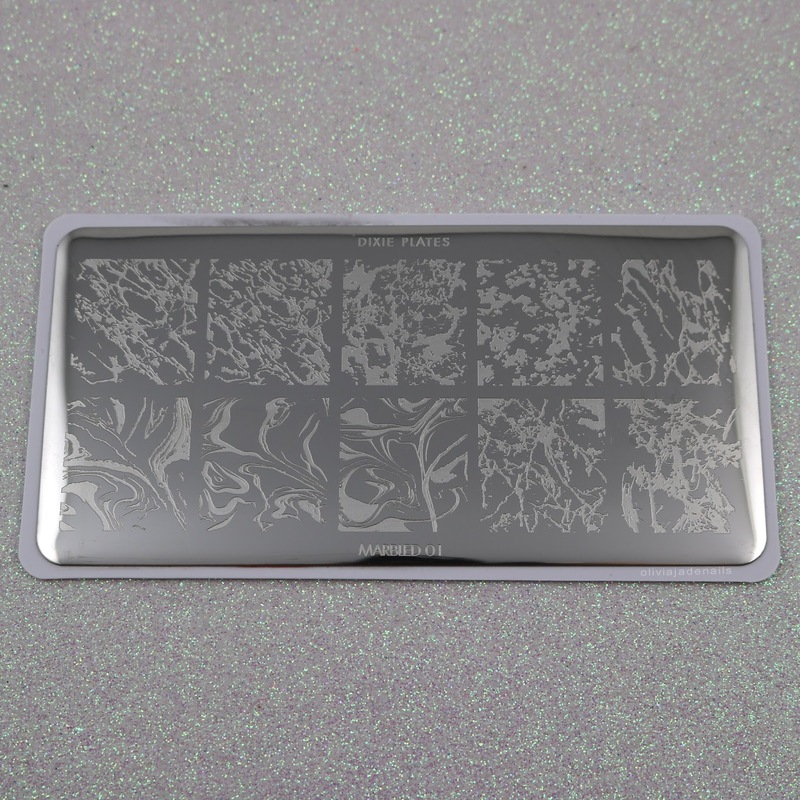 If you are like me then you probably thought that Uberchic's Christmas stamping plate Holiday Jingle (you can see my swatches and review here if you missed it) would be the last stamping plate being released. Well surprise! 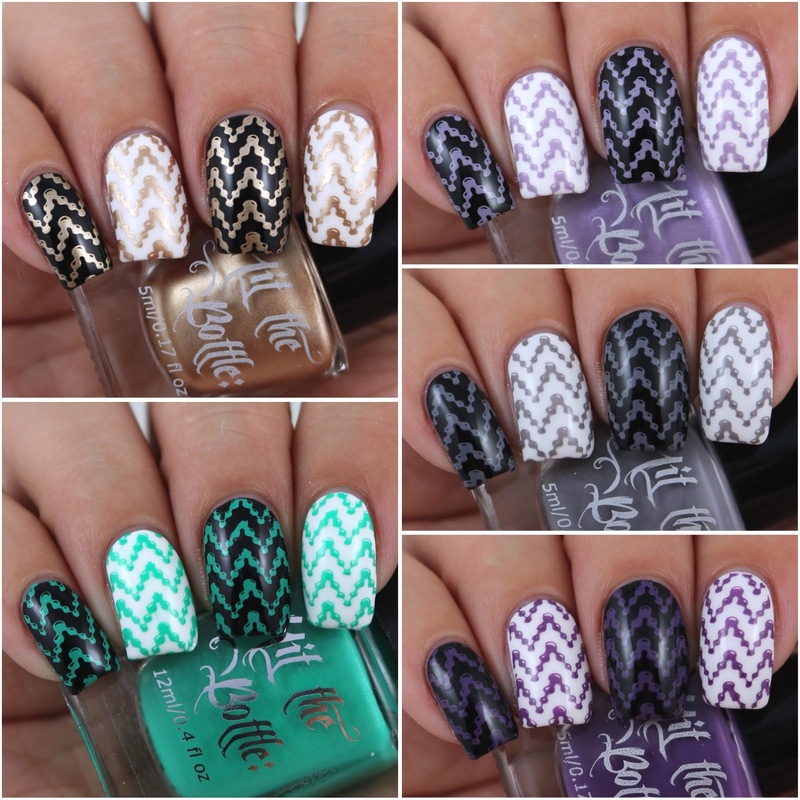 Uberchic have just released another new collection (Collection 22 - which I will have swatches and a review of soon) and the Got Chevron plate. 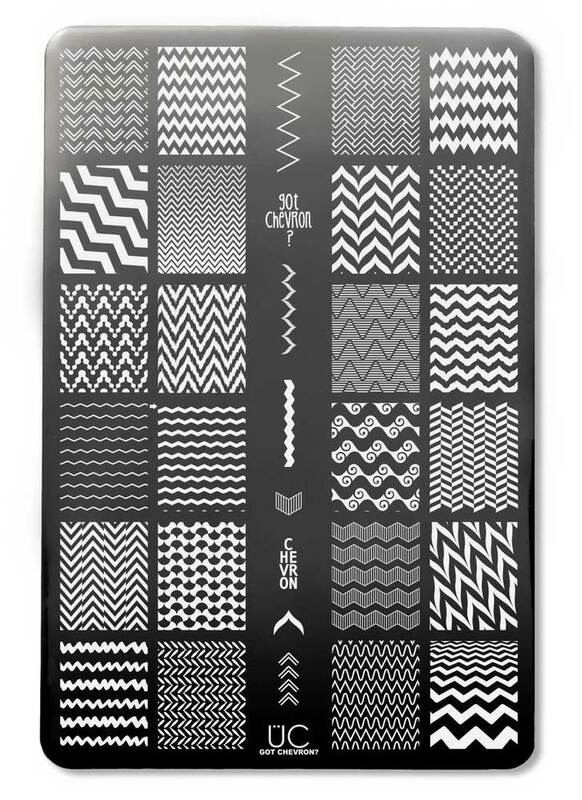 The Got Chevron plate was made in collaboration with JayLynn (GotNail). In true Tracy style, I had to do a neon gradient. 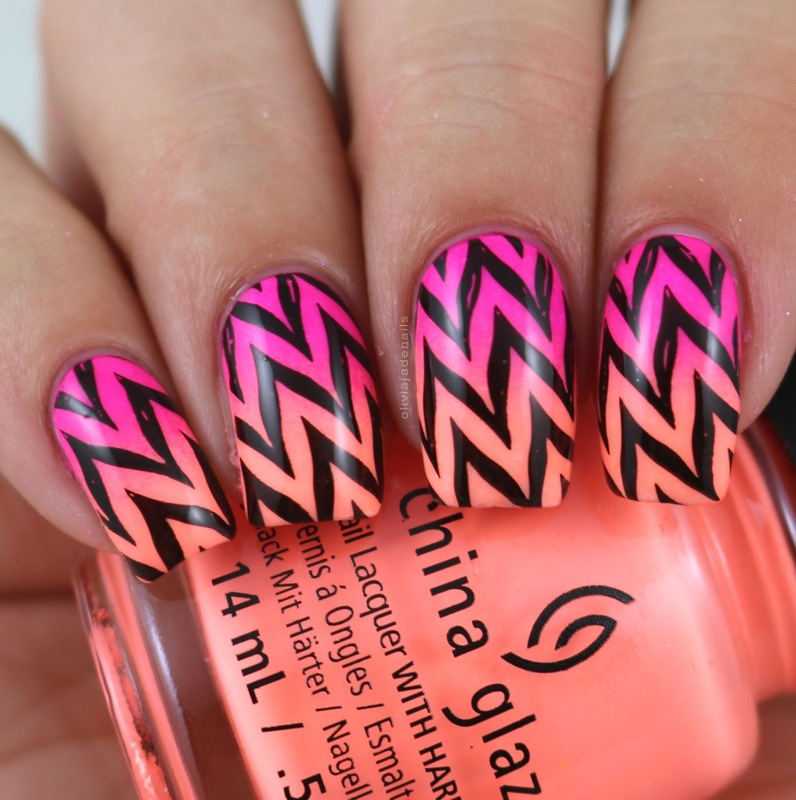 There is just something about zig zags and neon gradients that just works! I love how this mani turned out. For my gradient I used China Glaze Purple Panic and Flip Flop Fantasy. I really had planned on doing a black and white accent nail, but when I was trying to find polishes to team it with I re-discovered the Essie Silk Watercolor polishes. I sponged on Essie Muse, Myself, Art New-beau, No Shrinking Violet, Point Of Blue and Pen & Inky. 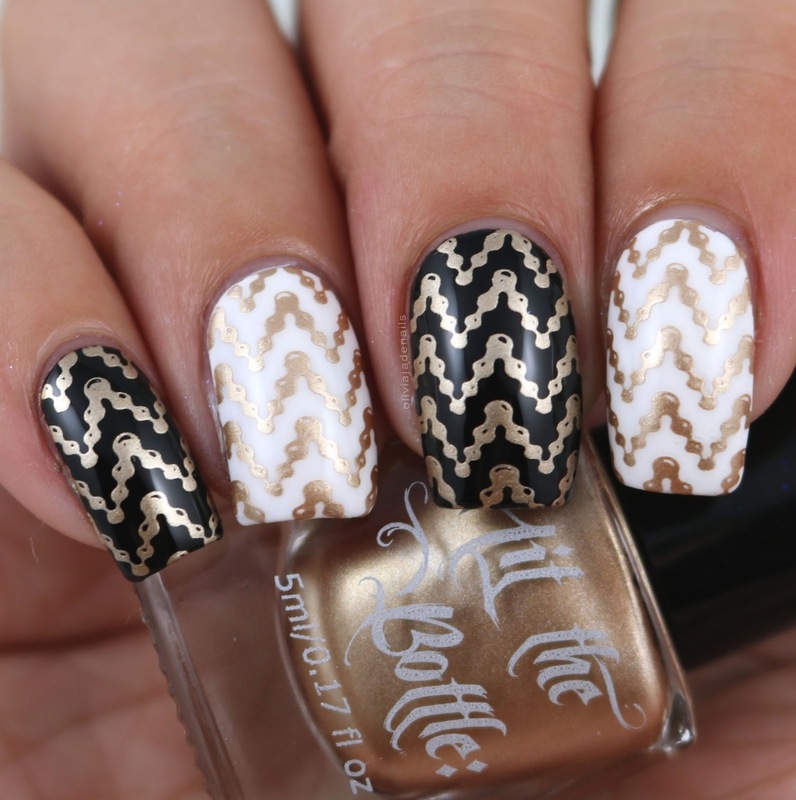 The Got Chevron Stamping Plate is available now from Uberchic Beauty. 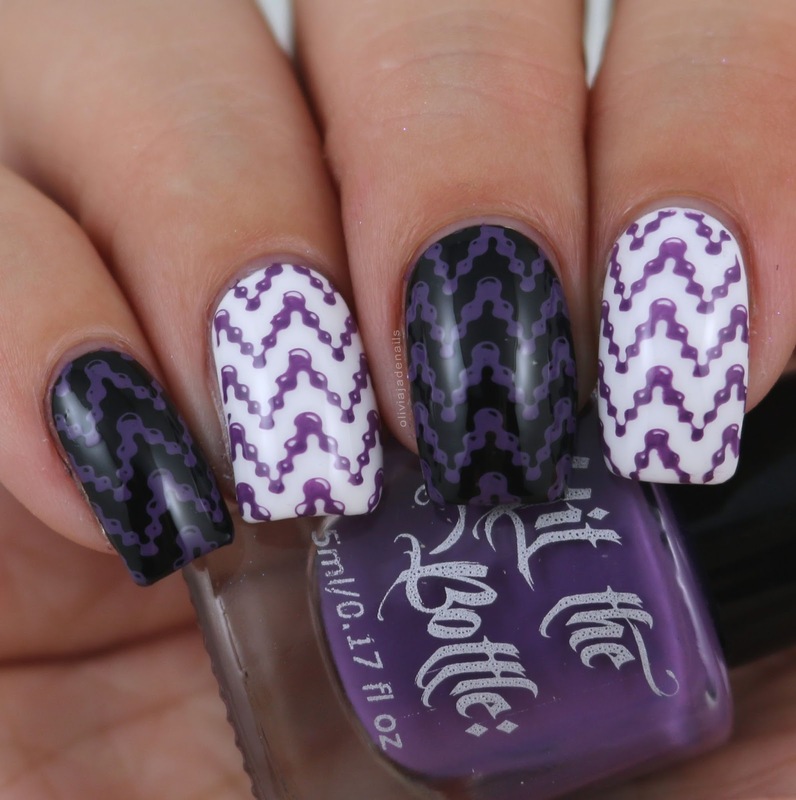 Hit The Bottle have recently released a bunch of new stamping polishes. Of course, I just had to get my hands on some. I also picked up the missing neon from my collection as well as an older grey stamping polish. I really need to sit down and work out which of their stamping polishes I am missing and complete my collection, but that is a job for another day and time. Today I have the five newest stamping polishes to my ever growing collection. Calypso Gold is a soft brownish gold stamping polish. As you can see this one stamps well over black and white. I think this one looks better in person than it does in my pictures (especially over white). My lights make the polish disappear. 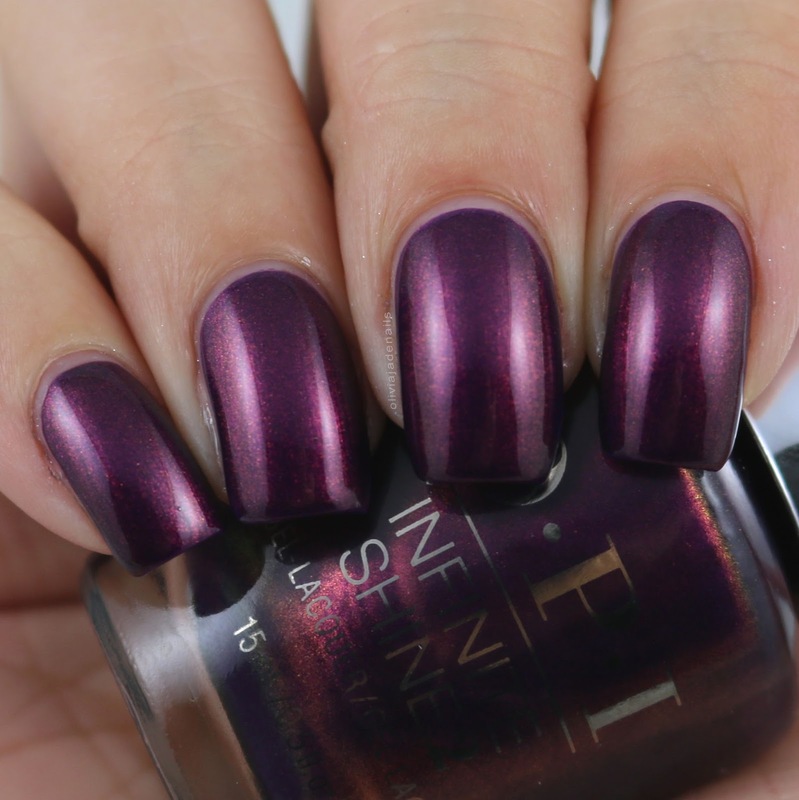 Grape Minds Think Alike is a deep, dusky purple stamping polish. Big fan of this one! 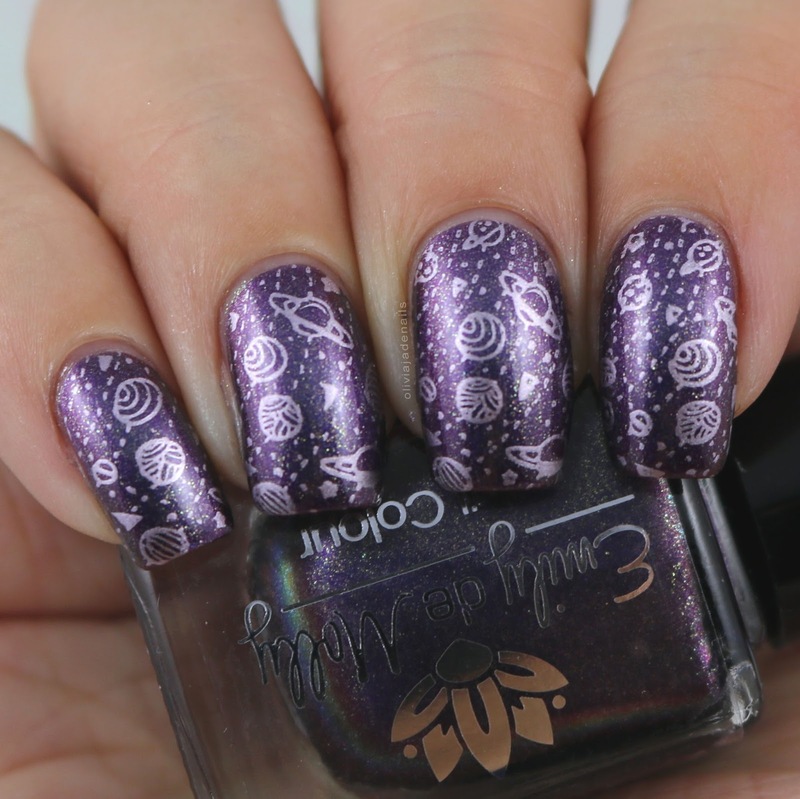 Lavender Squall is a pale greyish purple stamping polish. This one does have a slight shimmer in the bottle but I can't see it once it's on the nail. Again, a huge fan of the colour of this one. 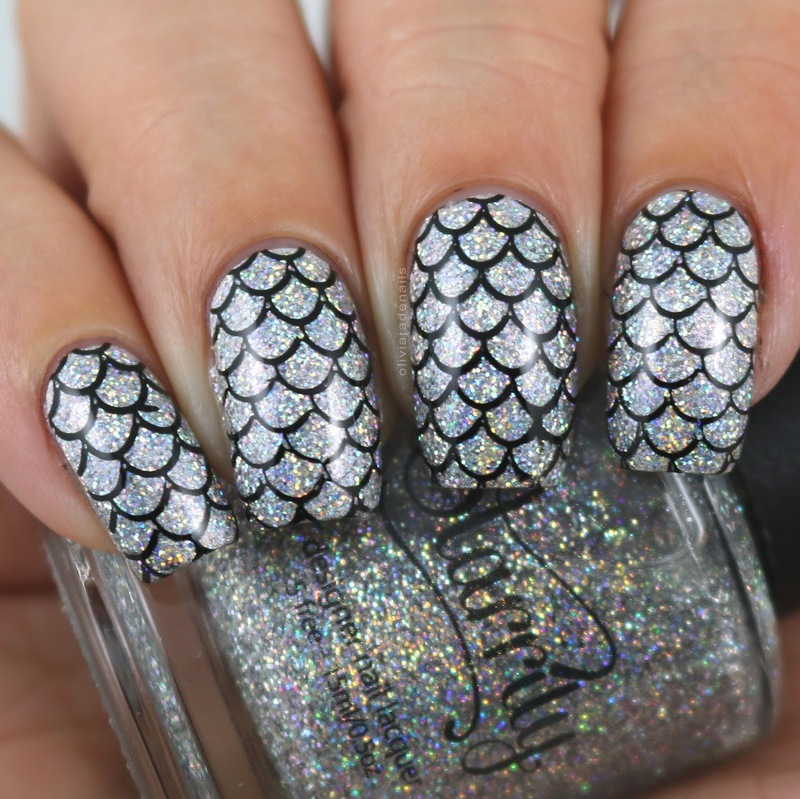 Looking For Mr Grey is a mid toned grey stamping polish. I am so happy to have this one in my collection. I have been after grey stamping polishes for a little while now and Hit The Bottle have come through with the goods for me. 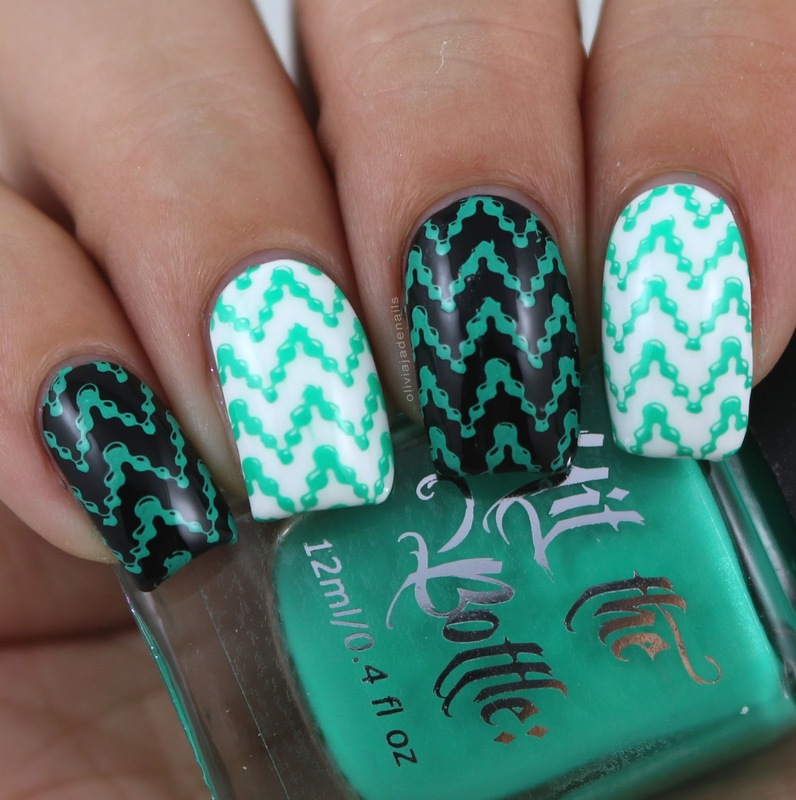 Seas The Day is a bright aqua "neon-esque" stamping polish. The missing neon from my collection! This is such a pretty colour. It is darker than it appears on camera, but still a good colour. 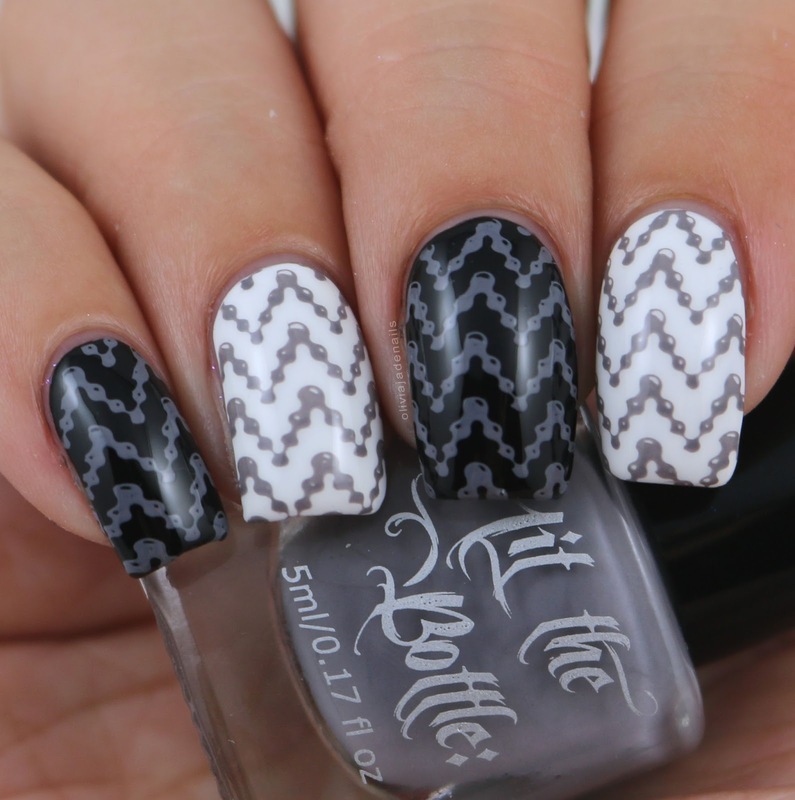 Like with all Hit The Bottle stamping polishes these stamp beautifully over black and white. Seriously, Michelle makes some of the best stamping polishes. If you haven't tried them then you definitely should. I don't think I could recommend them enough. All of these polishes (along with lots of others) are available from Hit The Bottle. Earlier this week I received some surprise nail mail from Sally Hansen with one of the new Salon Chrome kits. I have seen these on Instagram from some of the international girls but had no clue that they were coming to Australia as well. In total, there are five limited edition kits in Rose Gold, Holographic, Gunmetal, Mermaid and Peacock. Each kit contains Blacky O or Frill Seeker from the Miracle Gel range (which powder you get decides which polish you will receive), a chrome powder, an applicator, a Special Effect Top Coat and the Miracle Gel Top Coat. There are also clear instructions on the box. Today I have Peacock to share with you. Peacock is a purple-blue metallic. I do really like the colour of this one. It definitely looks more shifty in person than it does in my pictures. It does make a huge amount of mess though (or maybe that was my fault?). Seriously, the powder went everywhere! You can even see it one the polish bottle as well. Overall, I do think these powders are pretty cool. I definitely would be interested in trying some of the others in the range. I also think that a latex barrier would come in handy to clean up some of the mess made. What do you think of all the powders that are on trend at the moment? The Sally Hansen Salon Chrome kits are available December 1st from Priceline, Chemist Warehouse and selected pharmacies. I have two three tiered polish racks that sit on top of my polish drawers. I put any new polishes that I need to swatch straight into these racks so that I don't put them away and forget about them (something that I use to do all the time). For the longest time, my racks have consisted of Emily de Molly polishes - and they still do. Today I have a few limited edition polishes from a few months ago (I really can't remember when I purchased them) and a couple of other polishes that were released at some point this year (but again I can't remember when I actually purchased them - or when they were released). Some of these may still be available, while others may have sold out. Bring The Light is a very pale purple holo with silver micro glitter. I seriously LOVE this polish. The colour is gorgeous, the holo is amazing and so is the formula. My swatch shows two coats. LE53 is a pale creme, subtle holo with subtle gold shimmer. Such a good colour and a great formula. I used two coats for my swatch. LE54 is a pink subtle holo with blue shimmers. Huge fan of this one, but that's probably no surprise seems I love pink polishes. The formula is also great and is opaque in two coats. LE55 is a pink based mauve with gold shimmer. Again, this one is quite a pretty colour with a great formula. I used two coats for my swatch. LE56 is a purple/red multichrome with gold to blue shifting shimmer. I love the colour and shift of this one. 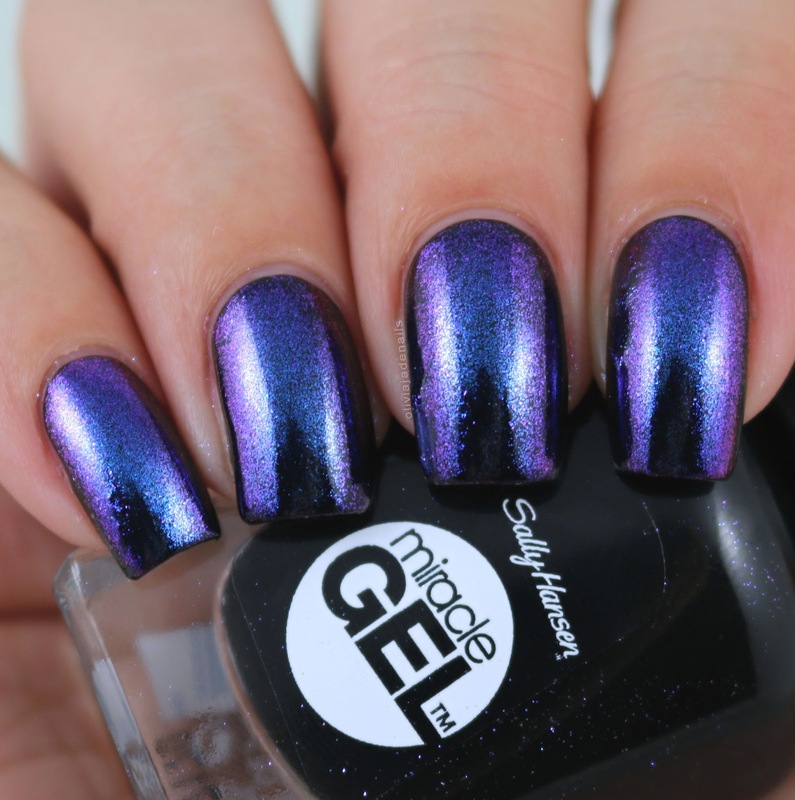 Like with the other polishes, this one has a great formula which is opaque in two coats. Perception Is Key is a green/purple multichrome holo with ultra thin, ultra holographic silver micro glitter. I love this one. I really don't know why it took me so long to grab this one. The colour is great and so is the formula. I used two coats for my swatch. At the end of the year I am planning on doing a bunch of favourites posts like I did last year. I have a feeling that it is going to be an impossible task to pick my indie favourites. I know that there will definitely be a lot of Emily de Molly polishes in the line up, that's for sure. Today I have a little blast from the past. I have been working my way through all my untried polishes when it occurred to me that I have a bunch of stamping plates that are untried as well. A lot that I was so excited to play with but then for one reason or another forgot about. Please tell me that I am not the only one that does that? 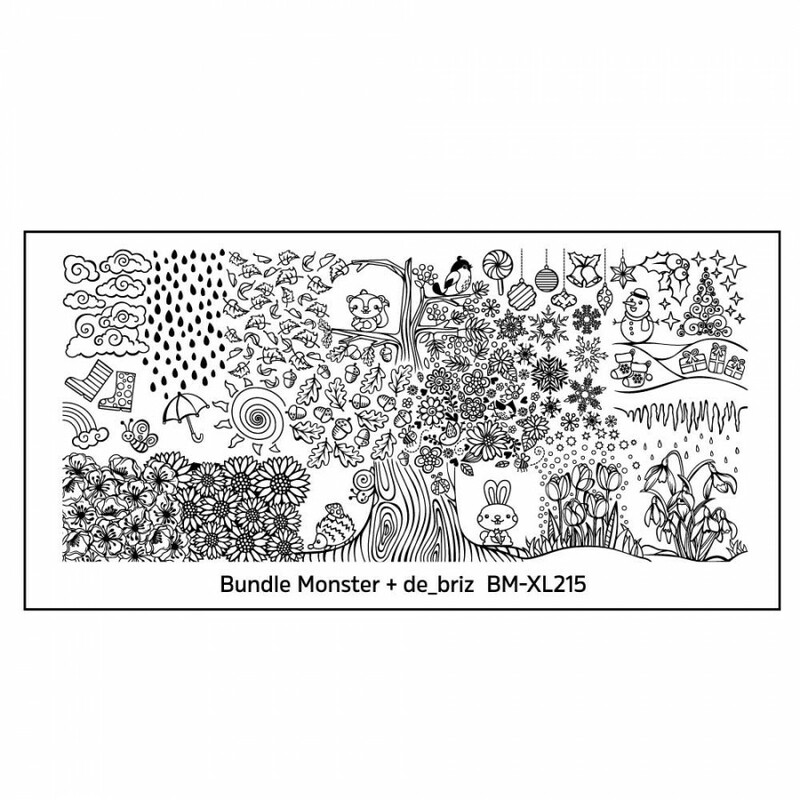 Anyway, among some of my untried plates are two of the Bundle Monster Collaboration Sets. Today I will be sharing set three with you. 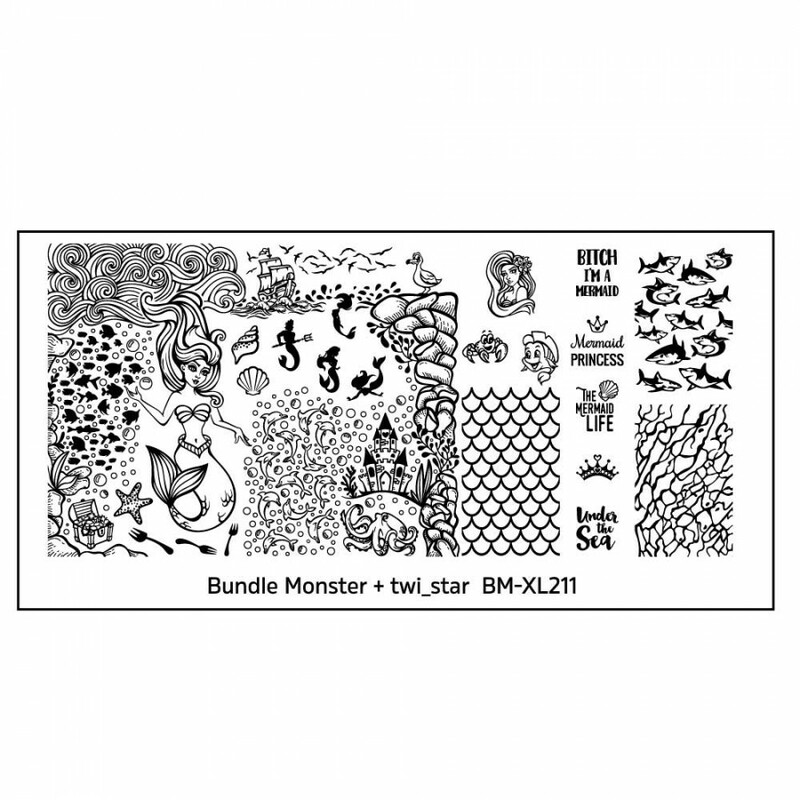 The first plate in this set was made in collaboration with twi_star and has an ocean/mermaid theme. I'm a little on the fence about this plate. It's not really my cup of tea but it definitely will come in handy for nail art challenges. For this mani I used Color Club Harp On It and Starrily Ultima. Stamping polish is Powder Perfect's Black Stamping Polish. 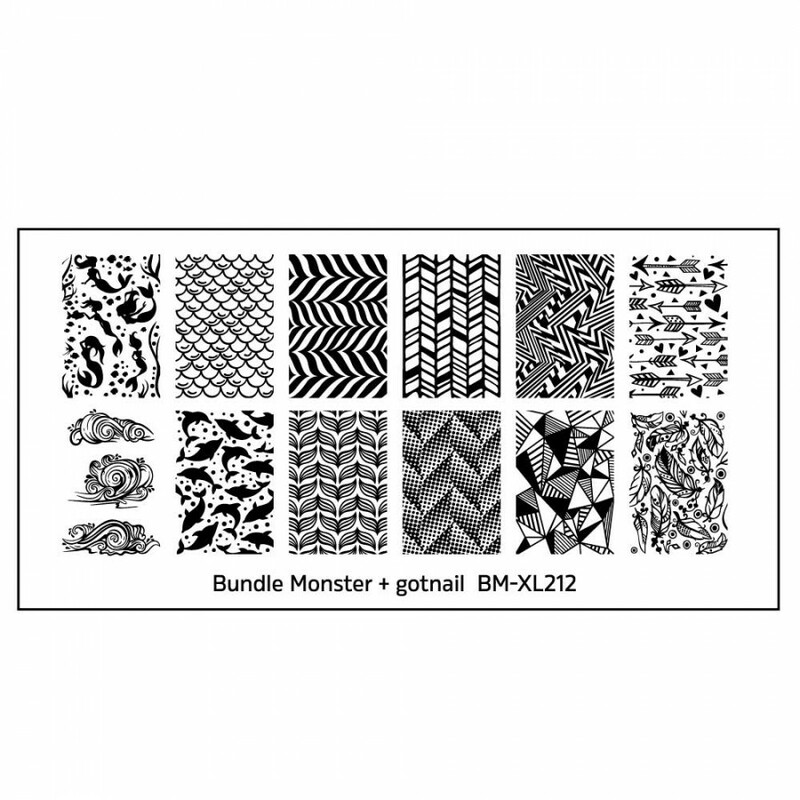 This plate is made in collaboration with gotnail. This plate is more my style. I love the mix of full image designs. 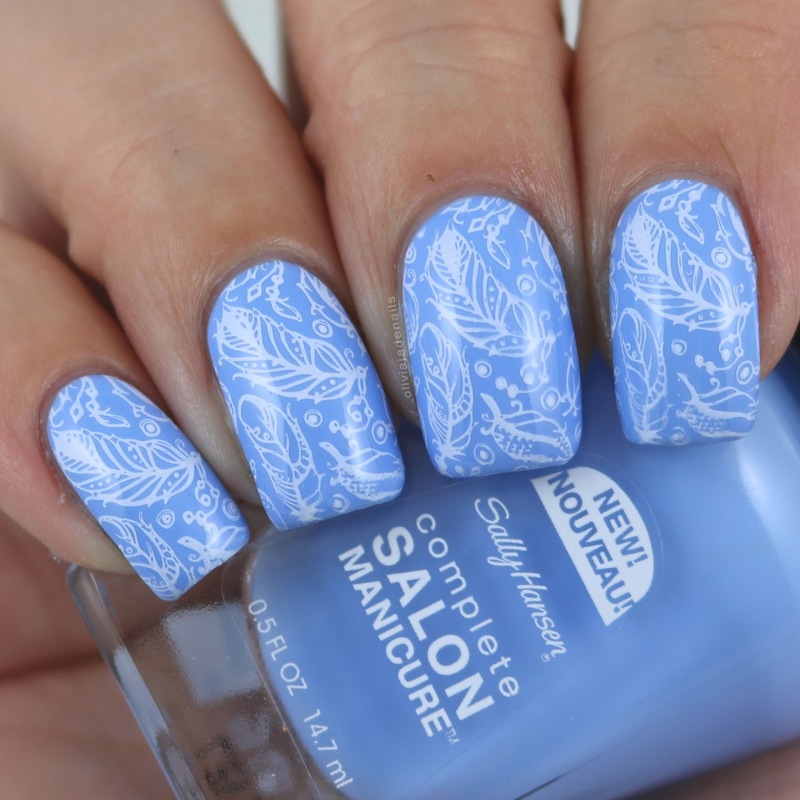 For this mani I used Sally Hansen Crush On Blue and stamped using Powder Perfect's White Stamping Polish. This next plate was made in collaboration with Kelli Marissa and has an intergalactic theme. This plate has definitely come in handy for me since I purchased it. 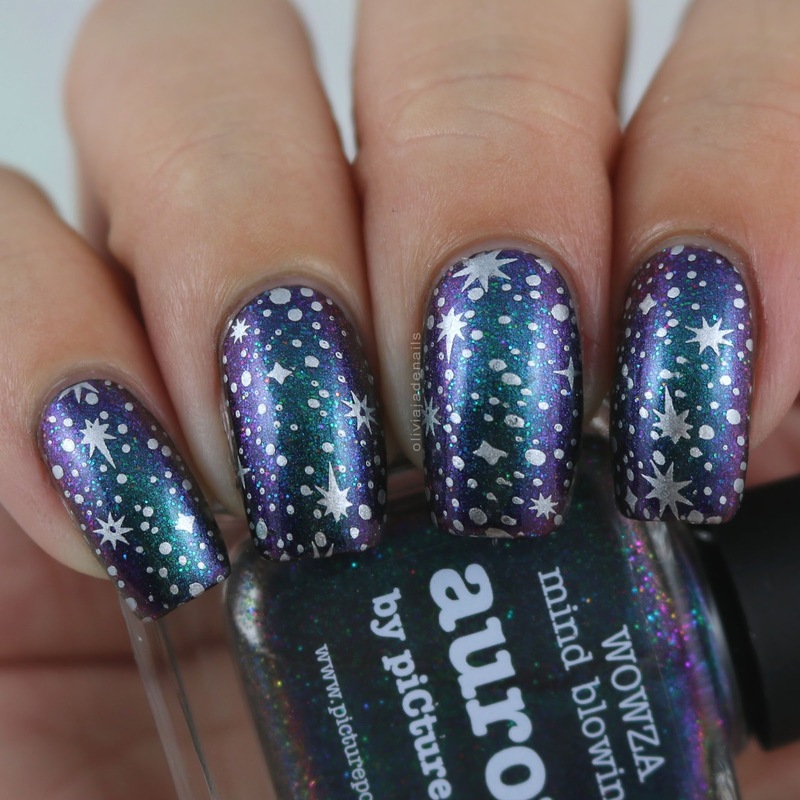 It seems to be my go to plate when it comes to galaxy manis. The first mani I did using this plate I used piCture pOlish Aurora and stamped using Powder Perfect's Silver Stamping Polish. The second mani I did using this stamping plate I used Emily de Molly LE56 and stamping using Essie Nothing Else Metals. 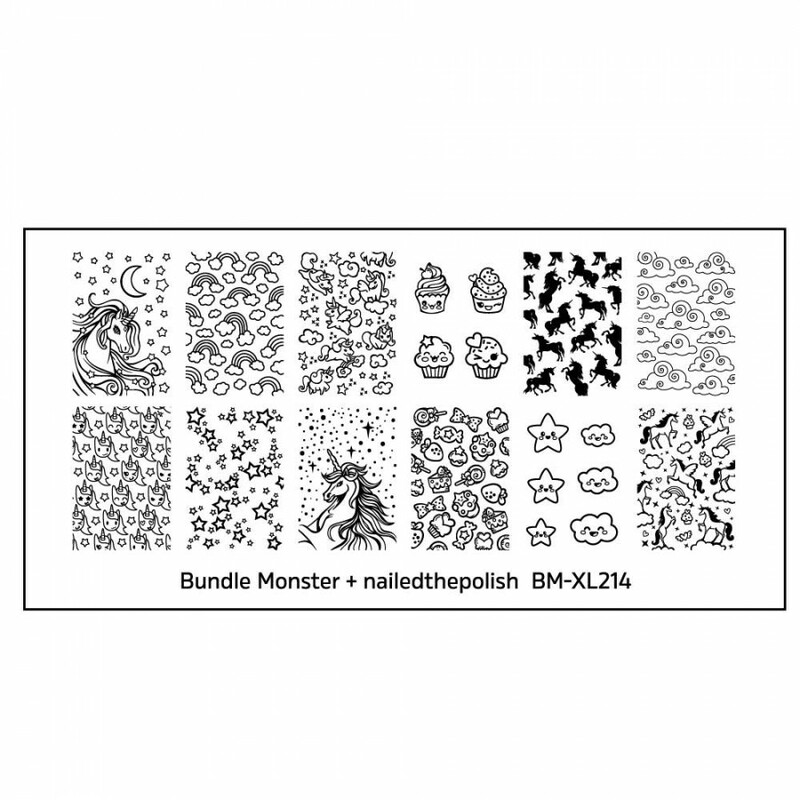 This unicorn plate was made in collaboration with nailed the polish. I am a big fan of that star image in the bottom row. My daughter also loves the kawaii cupcakes. I wanted a really colourful base for this image so I used the entire Pastel Pets Collection from Pretty Serious. I stamped using Powder Perfect's White Stamping Polish, although I wish that I used a different stamping polish so you could see the image better. Last, but certainly not least, is this plate made in collaboration with de_briz. I'm not sure I am really a fan of this plate. It's quite mismatched and isn't really a plate I would use too often. 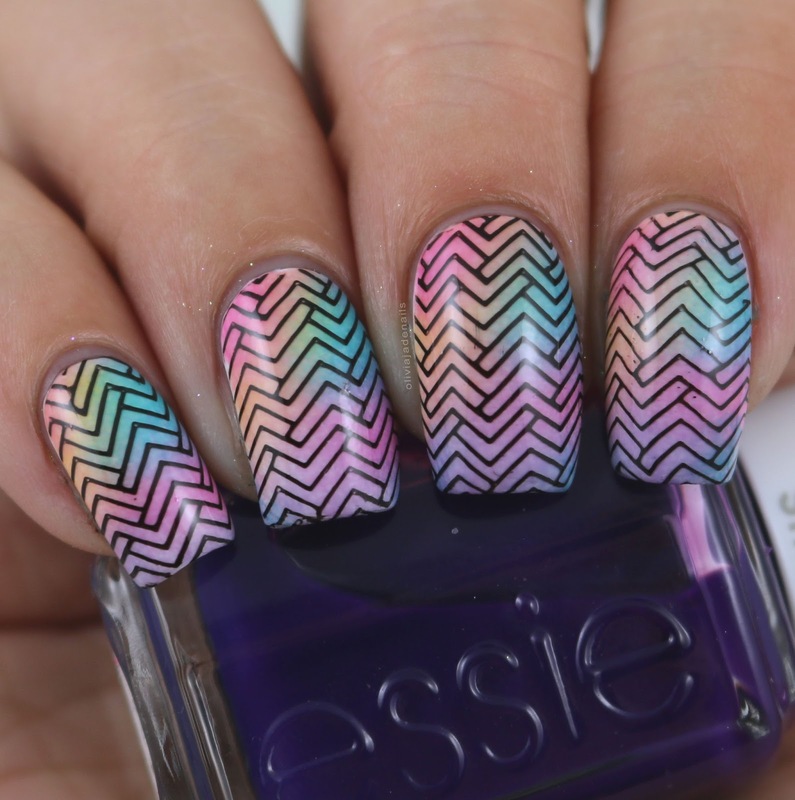 I did cheat a little with this next mani. Yesterday I did a reciprocal gradient for a challenge and I thought it would be interesting to see some stamping over it. Ta da! Polishes used are Hit The Bottle High Voltage Violet, I Pink Therefore I Am and Powder Perfect's Black Stamping Polish. Overall, I think there are some good images among these plates but as a whole they aren't a favourite of mine. My personal picks of these plates would have to BM-XL212 and BM-XL213. Did you pick up any of the collaborations plates? I also have set four which I will be swatching and reviewing soon.